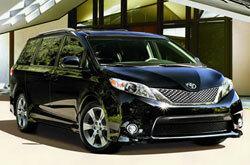 2013 Toyota Sienna reviews from Kenny Kent Toyota can be found underneath the video below. There is a reason Kenny Kent Toyota is the chief Toyota dealer in Evansville. We provide you with Sienna reviews by the best writers in Evansville. The following article is stuffed with beneficial material- it contains everything so that you can make versed decisions about the Toyota you want to buy. Kenny Kent Toyota is always available 7 days a week to answer questions you have. Do not hesitate to call us to speak with our Sienna specialists. Is the Toyota Right for You? Check out the 2013 Toyota Sienna against versus similar autos like the 2013 Nissan Quest, Chrysler Town & Country, Honda Odyssey and the Dodge Grand Caravan, and you will see that the 2013 Sienna wins over those vehicles in numerous areas. Check out the reasons see why! 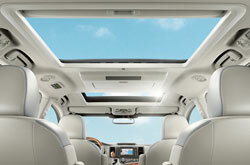 Take a peek inside the 2013 Sienna - view video now! Our Toyota dealership in Evansville is located near many well-known close by cities! So, you're a brief spin away from receiving real OEM parts and work from Toyota technicians! We also provide a long warranty on repairs! The friendly technicians at our Toyota repair facility in Evansville will help your Sienna run at its peak. We can manage a manageable chore as an oil change, or deliver quality involved Toyota Sienna service and repairs like strut and shock repairs, timing belt replacements and Sienna transmission rebuilds. Moreover, you can anticipate getting cheap service at our Toyota auto repair center in Evansville. Get specials on the web. You can view and print out discounts by clicking the succeeding line of text.